When REY first came onto the scene in the Canning Basin it was a mystery player that snuck in and snapped up a 25% interest in highly prospective land smack bang in the middle of blocks owned by major oil players. These major players had just discovered oil in the Canning Basin – the Ungani Oilfield . This oil field was discovered in 2011 and may hold as much as 10 million barrels gross and produce as much as 5,000 to 7,000 barrels of oil per day (BOPD). We called REY’s cunning land grab the “jam in the doughnut” and unmasked its identity in our exclusive article: “Who Is The Mystery Third Man? We Reveal The Next Junior Explorer In WA’s Canning Super Basin.” REY managed to acquire a 25% share in two blocks in the Canning Basin called The Fitzroy Blocks which the Ungani Trend runs right through. The prized blocks REY has a stake in are prospective for conventional oil as well as unconventional oil and gas. Bottom line – REY could sit back and enjoy the ride as the oil majors are doing all the work, either drilling in the surrounding area or in the Fitzroy Blocks. Either way REY is in a pretty sweet position – with exposure to serious upside. So sweet in fact that we followed up our previous article with another yarn about the US energy giant Apache Resources farming in to the Canning Basin; “ 50 Shades Of Rey: Which Energy Giant Just Farmed Into The Canning Basin?” However exploration plans are currently under review – REY’s big JV partners, Buru (ASX:BRU) and Mitsubishi, are deciding on where to sink the next drill. REY is considering going it alone and sole risking an exploration well on one of its blocks if the JV doesn’t propose one for 2014. This would mean REY funds their own well and would take 100% of rights to anything found. We’ll have more on that later, but as you can probably tell REY is a fast moving company that doesn’t like to sit on its hands! While it waits for the next move up north, REY has fired the starting gun on an oil well spud down south in the Perth Basin. The Perth Basin in Western Australia is renowned for its mineral sands, coal and oil and gas. The basin stretches for 1,300km along the coast of WA and in the past ten years 11 commercial oil and gas discoveries have been made onshore. The big name project in the Perth Basin is the Hovea oil field which was developed in a Joint Venture between Origin Energy and ARC Energy. 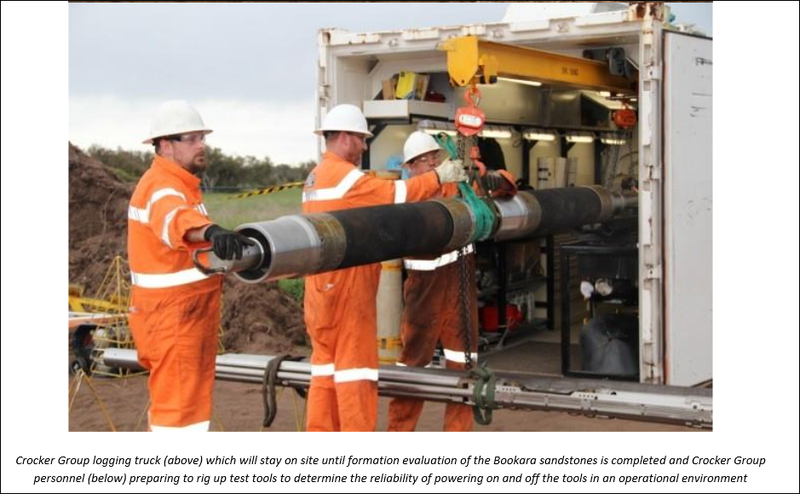 It’s reckoned to have reserves of 9.4M barrels of oil and is now being pumped from the ground and trucked to BP’s refinery at Kwinana, south of the state capital city of Perth. A nice little earner that – and now REY is getting in on the Perth Basin action. 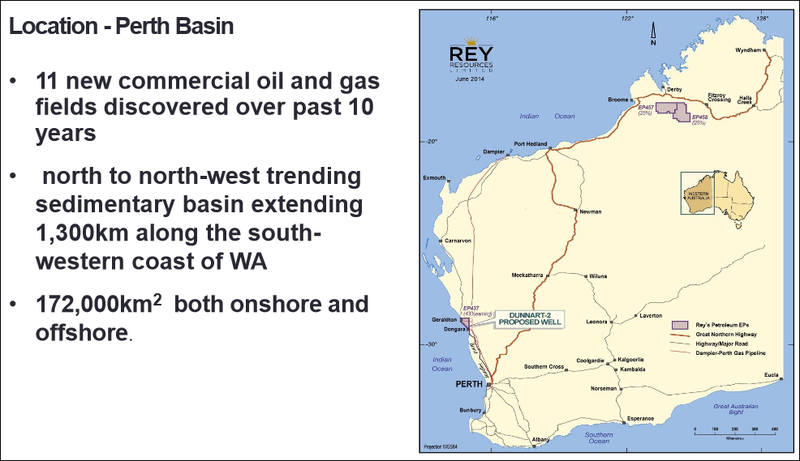 REY has signed a farm-in agreement with Key Petroleum Limited (ASX:KEY) to earn a 43.47% share of an onshore exploration permit in the Perth Basin called EP437 that is 55km to the south-east of the port city of Geraldton. Following the Next Oil Rush article on ASX:RLE, International Feeding Frenzy in Australia’s Hottest Shale Gas Region Puts Undervalued Junior on M&A Radar , RLE has risen as high as 40% since. So why is REY making a Perth Basin play? 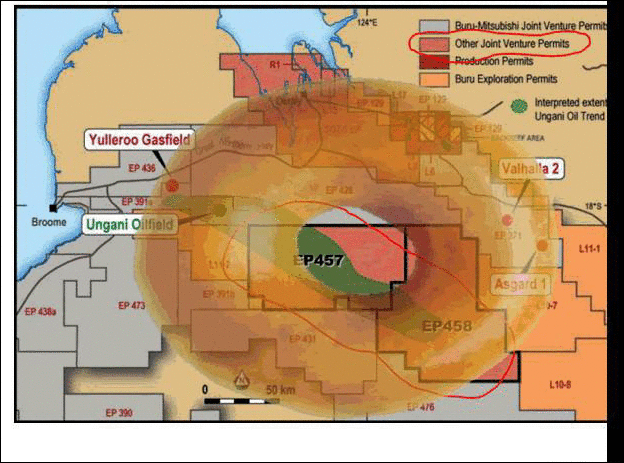 Things are moving fast for REY in its Perth basin play – exactly its plan. REY needs some excitement (and ideally some positive cash flow or oil discoveries), and it’s certainly got it by farming into KEY’s slick Dunnart oil play. The Dunnart well is not a company making well by any means – the Canning Basin project is the one that REY really need to move forward for REY to increase in value – however no use sitting around waiting for something to happen in the Canning. 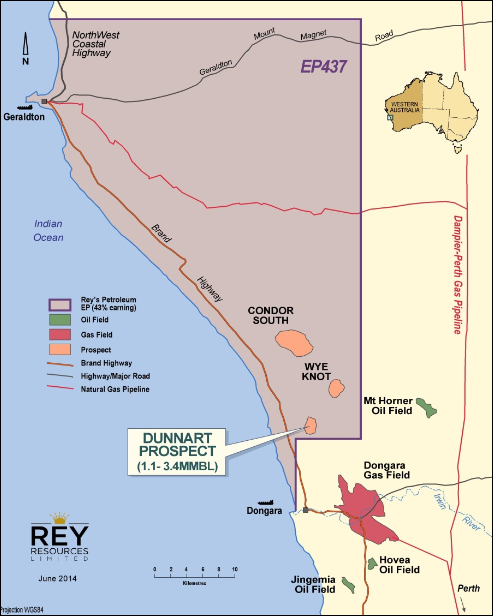 Dunnart (the well REY now has a stake in) is located on a block called EP 437 near the coastal town of Dongara which lies 55km to the south-east of the port city of Geraldton. The prospect has a tilted fault block which is defined by seven seismic lines and one strike seismic line. Regular readers of The Next Mining Boom will know that we call REY’s Canning Basin oil and gas play the “jam in the doughnut”. If you’re late to the party you can read why in our original article “Who Is The Mystery Third Man? We Reveal The Next Junior Explorer In WA’s Canning Super Basin.” But we love that nickname so much we’ll tell you again here. REY snapped up a 25% stake in two blocks known as EP457 and EP458 – together known as The Fitzroy Blocks. Now any land in the Canning Basin is worth a few bob but these blocks appear to be particularly prospective. Just to the north-west on a neighbouring block is the Ungani oil discovery and the Ungani oil trend stretches across REY’s blocks as well. The jam in the doughnut! Any discovery in the highly prospective blocks surrounding the Fitzroy Blocks will impact positively in REY and all it has to do is ride its interest and let the major players do the heavy lifting. The Canning Basin permits have the potential to make REY a lot of money – they are definitive assets and REY has firm ownership. But work has been delayed a few months by the big guys. REY wants at least one well drilled this year at the blocks. 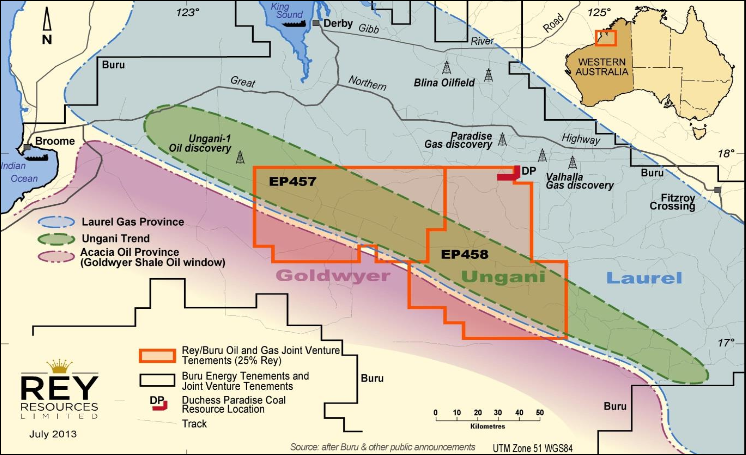 But the JV operator, Buru Energy (ASX:BRU) has announced a review of its 2014 drilling programme in the region along the Ungani trend, saying it’s ranking the prospects of each of its plays to determine which should be drilled as a priority. 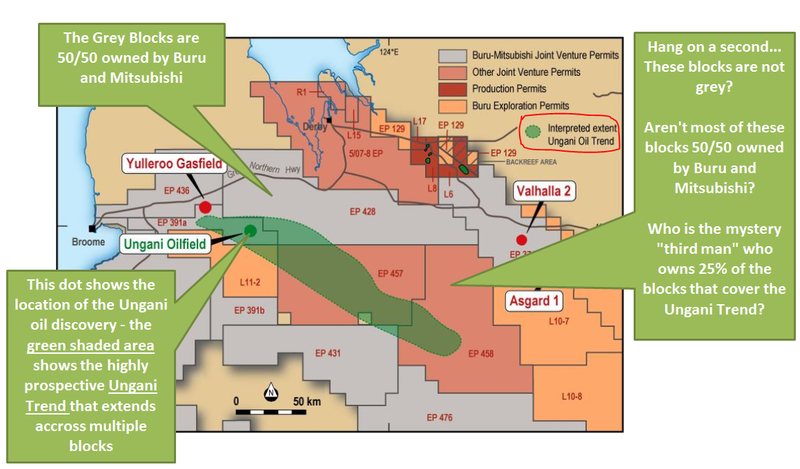 Buru is heavily involved in several other projects in the vicinity which are either closer to production or more advanced in exploration than the Fitzroy Blocks. However, Buru is still very much interested in the Fitzroy Blocks – it has done an extensive 234 km 2D line survey of the Blocks and the initial interpretation of the seismic survey data provides several targets for drilling, each of them similar in scope to the discoveries made on the Ungani trend by BRU at the exploration block above EP457. So the potential is indeed there for a big discovery on REY’s blocks – the Ungani trend appears to runs right across REY’s ground – you can see this in the green shading on the map above. Like we’ve said before, REY could just sit back and wait. After all, if Buru drills in a neighbouring block and finds oil it will have a positive impact on the value of the Fitzroy Blocks. REY could just sit tight. But instead of doing that, REY is in discussions with external financiers to see if it can secure enough support for a sole risked well covered by the terms of the JV agreement, in the event that the JV doesn’t want to drill this year. REY has just announced that it has executed a subscription agreement with an existing shareholder and sophisticated investor to raise $1M now and get a further $2M once it’s once completed some paperwork. This strategic partnership means that REY shouldn’t have too many problems finding large sums of cash to support their promising oil exploration endeavours – some very nice support to have. The Dunnart-2 well near Dongara that REY now has a piece of is set to pierce its primary target any day now. This is great for REY investors because the company is proactive while work up north in the Canning Basin is on hold. The future of the Fitzroy Blocks could go two ways – Buru announces it’s going to drill wells on the Fitzroy Blocks this year or REY announces it’s going to pick up the slack itself. Time is of the essence if any drilling is going to happen in 2014, so we expect to see announcements either way very soon. REY isn’t a company that just waits around for fate to come knocking. REY is the company that knocks. The rest of 2014 is set to be very interesting for REY investors. Lots of catalysts, lots of blue sky. 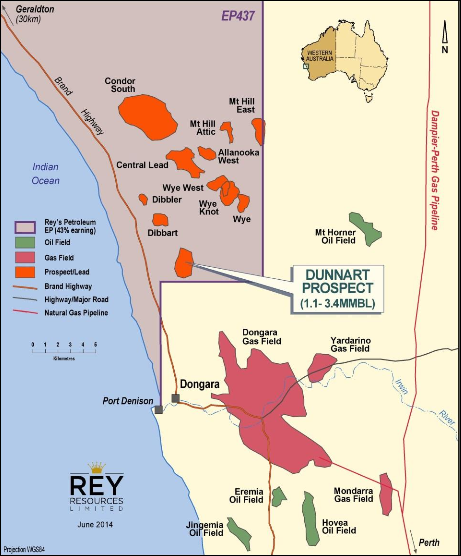 Investing in Dunnart-2 in the Perth Basin could bring REY its first successful oil well. Looking into sole risking wells for its 25% stake in the Fitzroy Blocks keeps that project hot, and raking in $1M, plus potentially another $2M from a private investor is a great tick of confidence towards REY’s plans. 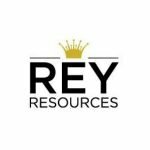 REY is currently drilling and set for results any day now, plus a work programme in the highly prospective Canning Basin that could yield a major drilling event very soon. By the end of 2014 REY could have flowing oil wells in the north and south of Western Australia and the share price to match it. We’re glad we got in early.